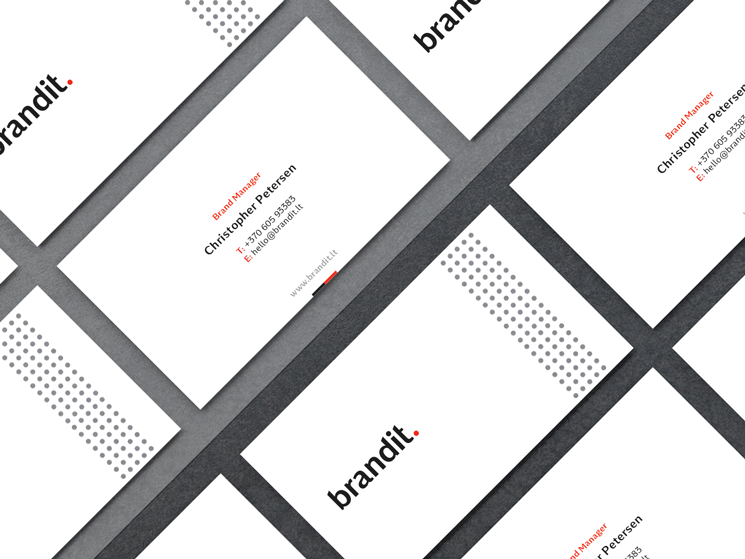 Armantas Zvirgzdas designed these business cards for Brandit, a Lithuania based branding design studio focusing on effective logos for startups. “Evertyime I approch a business, I try to look for symbolism. This time, the inspiration was more verbal than visual. I tried to define startup business growth, and the first thing which came to mind was a phrase “the sky is the limit“. The word ‘startup’ also has a coded meaning – it’s like setting something in motion in the ‘Up’ direction,” Armantas said. After getting his inspiration, Armantas was ready to work on its visual identity. “The company is related with startups and helps them to achieve growth. Since their logo has a red dot, I chose it as a symbol and decided to create visual identity which represents that growth,” Armantas explained. These business cards were printed by Balto Print in full color to achieve rich red tone on double sided 300gsm coated paper.